Gardening for wildlife Oh! Oh! Jiminy Crickets! Ok, let's start with identification. You know you've got one of them if you find an insect about an inch long with a giant back leg, so long that the 'knee' juts right up over its back. Now there are only about 27 or 28 regular species in the the British Isles, so there aren't many to consider. And many of those are rare or very restricted in their range. But the first place to start is with the antennae. If they are rather short and stout, you're looking at is either a grasshopper or a groundhopper. This is the Meadow Grasshopper. 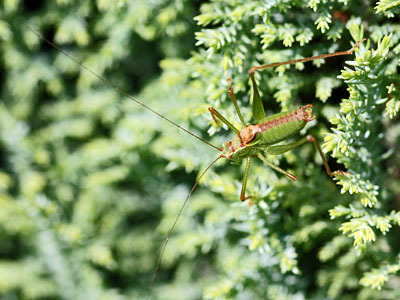 If they are really really long, then it is a bush-cricket. Simples! And the crickets? Well actually there are only four species, and all are rare. Oh, and there's a very strange thing called a Mole Cricket, but that's rare too. The grasshoppers eat mainly grasses in unimproved grasslands and downland. One can only imagine how many there used to be when there were hay meadows everywhere, but now the chirruping of grasshoppers is something you rarely hear. They are difficult to accommodate in gardens UNLESS you have a really large lawn or paddock or fields which you can let grow as a meadow. If you do, it will benefit so much other wildlife too. And there are four species (Common Green, Field, Meadow and Mottled) that are found in lowland areas throughout much of Britain, so this isn't just a 'southern' wildlife thing. 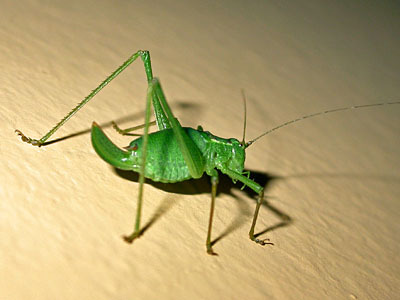 The bush-crickets are rather easier to entertain, but unfortunately most are found only from the Midlands south. Boo! But many are expanding their range, and they are definitely ones to watch out for in the north in the future.Hooray! 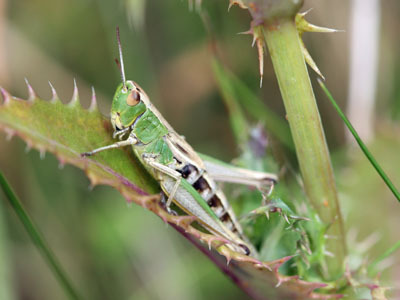 Bush-crickets tend to like hedgerows and shrubberies, with thick grass and flowers at their base, although the fast-expanding Roesel's Bush-cricket (which has a Nike tick along its side) likes rough grasslands too. 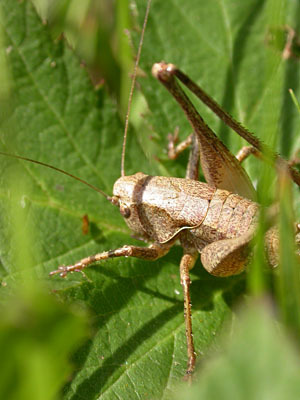 Species to watch out for include the Oak Bush-cricket (which is green and has long wings) and the Dark Bush-cricket (which is brown and wingless - photo below). And don't be afraid if you see one with a giant spear of a rear-end - that's just the egg-laying apparatus of the female, such as this Speckled Bush-cricket which I photographed on the wall in my hall one night when it paid a visit! And, and quiz question for ten points: in which famous film does the lead character utter 'Oh! Oh! Jiminy Crickets' upon entering a wizard's palace? 10 points to Wildlife Friendly! Very timely. I took a photo of a grasshopper in the meadow area of our village school field a couple of days ago - must go and see which sort it is.